While your vehicle is in our possession, we will do our best to complete the repairs in a timely manner with the safety of your vehicle being our top priority. 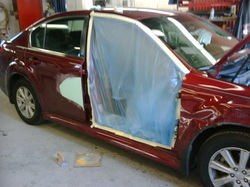 Our goal is to restore your vehicle to pre-accident condition. Gone are the days that 'my car will never be the same.' Our state of the art facility, complete with our laser frame and unibody measuring system, downdraft spraybooth and the experience and training of our technicians ensure your car will be as good as new. We installed BASF's waterborne paint system to give you the best and latest technology in automotive refinishing. Your vehicle's finish will retain it's excellent color and luster from the day it is sprayed, long into the days that you may no longer own it. We will keep it clean and repair as if it were our own. That's our promise! WE DO NOT SELL INFORMATION TO CARFAX!!!!! All information regarding the repair of your vehicle is kept confidential.